For a second day, more than a thousand buses on 40 bus routes in the greater San Salvador area were not operating. Bus owners pulled their units off the streets in response to gangs who were threatening with death anyone who did not comply. And it was no idle threat, as the number of murders of transport workers since Sunday rose to 8. The economic cost imposed by the gangs on the country was enormous. Bus operators said they were losing $800,000 per day. As many as 4000 drivers lost their daily wages. Thousands of workers could not get to work. Productivity was lost as workers arrived late after scrambling to find alternate transportation and businesses closed early to give workers a chance to arrive home safely. Secondary schools and universities cancelled classes when students did not show up. Traffic in the greater San Salvador area was in utter chaos today. The chaos was created when as many as 40 bus routes, run by private operators, refused to send their buses out. 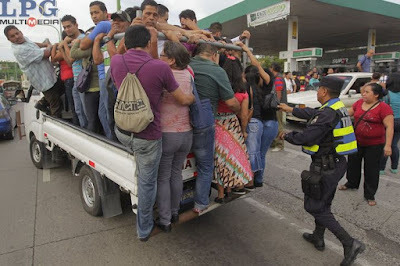 The bus stoppage was in reaction to the murders of four bus drivers in the past two days by El Salvador's gangs, and the burning of two micro-buses in the San Salvador suburb, Ciudad Delgado. The bus operators claimed they had pulled their buses from the streets to demand the government do a better job in tackling the gang violence. Private bus operators pay thousands of dollars each month in extortion payments to the gangs. The FMLN government in El Salvador is making claims that elements on the right are attempting to foment a coup to destabilize and overthrow the government. Describing it as "obscure groups" advancing a "black hand strategy," the FMLN asserts that these anti-government plots are being advanced through social networks. They described it as an attempt to foment a "soft coup" and not necessarily a violent overthrow using the armed forces. I am no fan of the right wing parties in El Salvador. But it seems to me that talk of coups is a pretty transparent attempt by the FMLN to rally the party faithful at a time when the government's popularity is slipping because of its failure to address the public security problems in the country. In a letter addressed to government officials, gang leaders in El Salvador have called for the reinstatement of a gang truce, challenging the government's hardline security policies. The letter was made public on July 15, a month after it was delivered to authorities in mid-June, reported La Prensa Grafica. In the body of the letter, gang leaders ask for a "mechanism" that would allow for dialogue and an eventual peace agreement. The gang leaders who signed this latest statement are all currently being held in El Salvador's maximum security prison. News of the letter comes amid a slight dip in homicide numbers, with police reportingthat the first two weeks of July saw an average of 14 killings a day, down from 22 in May and June. This follows what has been reported as record levels of violence for the country. A recent poll by the University of Central America shows that three fourths of Salvadorans in affected areas are opposed to the resumption of mining of gold and other metals in their country. There has been a moratorium on granting permits for such mining since the mid-2000s under the Tony Saca ARENA administration and continuing under the subsequent FMLN governments. Enjoy this video of the wonders of El Salvador as captured from a drone-mounted video camera. A stunning chapel overlooking Lake Coatepeque in El Salvador is a contender in this year's World Architecture Festival. Named "Cardedeu," the chapel was designed by EMC Arquitectura. Click here for a set of photos of this modern chapel set above a volcanic crater lake.